An innovative label solution from Essentra Packaging has been selected for the launch of a new range of equine health products. Made in the UK, organic Aloeride from Santé Franglais is the choice of horse owners worldwide who want to help support their horses’ health and be sure of remaining competition legal. 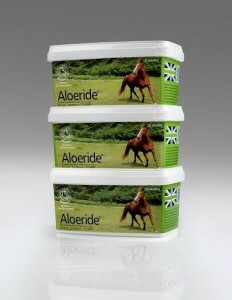 The label had to reflect the high quality of the product but at the same time be practical and robust, taking into account where the finished product was to be stored and used, in working equine centres. Essentra’s solution attracts potential customers with an eye catching design featuring a high quality photographic image, together with clear product information and a QR code. Labels are printed on white top coated Polyethylene with an overall silicone varnish added to provide a durable finish capable of performing under the various conditions found in equine centres. In the process of design origination the use of Perfect Highlight software with intelligent technology allowed for a finer tint of colour, giving a sharper image and ensuring that the overall image is highly defined. Another innovation in Essentra’s design is the fact that the label has been produced as a wraparound for the container. This helps to create greater on-shelf presence and impact compared to the use and cost of several smaller labels. The wraparound was achieved using a variety of tapers rather than one continuous taper over the length of the label, allowing one label to fit the product in such a way that all the relevant information is in the correct position while also giving continuity to the finished pack. Han van de Braak, Santé Franglais Director says: “We worked closely with Essentra’s designer throughout and the outcome is a fabulous-looking, perfectly-fitting label that was delivered on time and on budget. Headquartered in the United Kingdom, Essentra’s global network extends to 29 countries and includes c. 5,500 employees, 42 principal manufacturing facilities, 64 sales & distribution operations and 5 research & development centres.